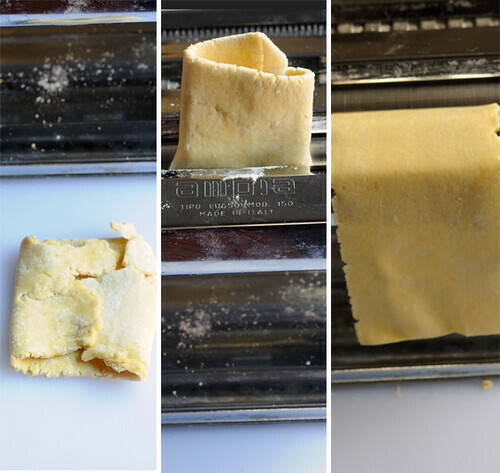 Skinny Homemade Egg Noodles: Make your own homemade egg noodles using a food processor and a simple pasta machine. These are a holiday tradition in our family. I thought everybody ate homemade noodles together with gravy and mashed potatoes. After all, it was a holiday tradition on the Indiana farm of my childhood. After marriage to my Texas-born-and-raised husband, I was dismayed to discover he didn’t even like the sound of it. Together? Noodles on top of potatoes? But it wasn’t long before he was a fan and of course, my boys were raised with the idea. My Ohio-born daughter-in-law raved about her Grandma Teeter’s excellent homemade noodles during the first weekend she ever visited our home. As you can imagine, Susie was immediately accepted into the family as a noodle lover we could trust. My Grandma Herd made her famous noodles by hand from start to finish. I can still picture her wearing a full-length apron over a simple cotton dress with her long gray hair twisted into a bun as she rolled out noodle dough as thin as possible on her formica-covered breakfast table. Flour was flying everywhere as she deftly brought the dough into submission with her silver-handled rolling pin. After letting the noodle sheets dry a bit, she cut wide strips, stacked them. Finally, she cut the stacks again short-wise into slivers she described as “thin as frog’s hair”. When asked her secret to fabulous noodles, I remember her saying, “It’s all in the broth.” Personally, I have found this more challenging than the noodles themselves. In our family, the noodle recipe is controversial. I asked around but could find no consensus. Aunt Marg says the best noodles come from using only egg yolks, cake flour, a dab of cream, and salt. That formula would result in some very tender noodles indeed, but she didn’t specify amounts. I prefer using all-purpose flour and a touch of baking powder to give my noodles lightness. The baking powder is an obscure detail I seem to remember copying from my best friend’s recipe book. This was coming from the same friend who eventually married Aunt Marg’s oldest son. Maybe Grandma gave her inside information or perhaps it was her own mom’s recipe. I’m not sure. One thing we agree on. 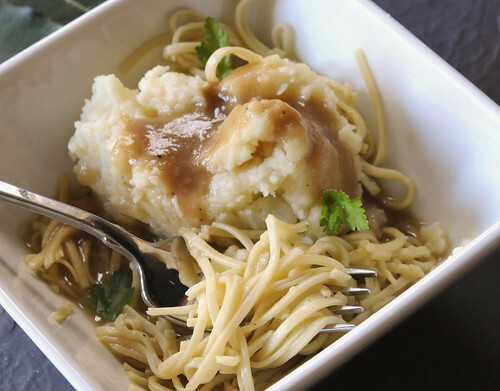 Serve and eat Skinny Homemade Egg Noodles with mashed potatoes and gravy. Since I’ve moved to Texas, I like to throw some cornbread dressing and buttered corn into the mix too. I’ll spare you a picture of that concoction. You can mix, roll and cut these by hand, but I prefer a simple noodle machine. A pasta machine will produce noodles much skinnier than I can cut. With that in mind, the directions on this post are for a noodle machine. Grandma would have nothing to do with a machine. Your noodles will be no better than your stock. Grandma said. My favorite way to prepare chicken stock is to put the bones of a rotisserie chicken into a slow cooker overnight. If you prefer, you could try the recipe I use for my Chicken and Dumplings, but I would leave out the lemon juice. Don’t be deceived by the small amount of dough produced by this recipe. It has a way of birthing babies and you will begin to think you won’t finish cutting noodles before Santa drops down the chimney. This recipe makes enough for 4-5 people or even more if there’s a lot of other food such as Thanksgiving. I usually double the recipe for a big family gathering. Don’t throw out the egg whites with the shells. Grandma and my sister-in-law, Susan, always make angel food cake with the leftover egg whites. If you like that idea, here’s a few ideas: Espresso Angel Food Cake, Chocolate and Vanilla Angel Food Cake with Dipped Cone Ising, Snowball Cake. First: Add flour to food processor bowl along with salt and baking powder. Pulse several times to mix. 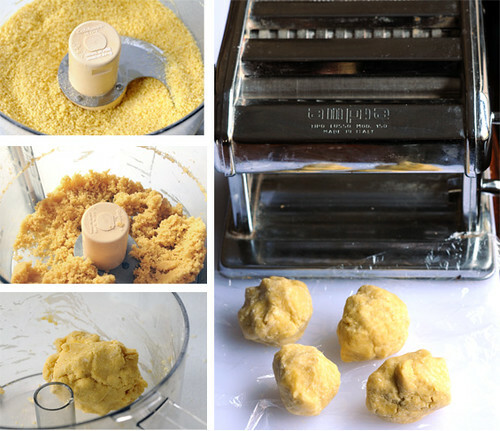 Add egg yolks and half of the cream to dry ingredients and process until the texture of cornmeal. Gradually add the rest of the cream by dripping it until the mixture is just damp enough to stick together when pressed with your hand. It should not be wet or excessively sticky. Knowing when you’ve added the right amount of liquid takes some experience best learned from your own mistakes or while watching over Grandma’s shoulder. If necessary, add more flour or cream/milk as needed. Use your fingers to press dough into a ball and remove from the bowl. Cover and allow to rest 10+ minutes. Divide dough into 4 sections. Smash each section into a flat pancake with the palm of your hand on a floured board. It’s OK, even advisable, to be liberal with the flour. Second: Set noodle machine thickness to 1 and roll one dough patty between the smooth rollers. Fold over and put through machine again. Repeat process at least 4-5 times until sheet of dough is smooth and shiny. Do this with each patty. Although this sounds time consuming, it goes fast once you get the hang of it. Set thickness of smooth rollers on 2 and roll each sheet through once or twice, tugging slightly on the dough as you pull it through. Keep moving the roller thickness up a notch and repeat the process. I like my noodles as thin as possible so I go all the way to 6 on my machine. Along the way, use flour whenever necessary to keep dough from sticking. As dough strips get thinner, they get longer. Cut in half cross-wise as needed. Third: When noodles reach desired thinness, lay them out to rest and dry making sure there is no overlap between strips. When noodles have dried just enough (again, experience is the best teacher), cut strips as long as you want your noodles. I usually make mine 3-4 inches. Feed strips through the fine noodle cutter. 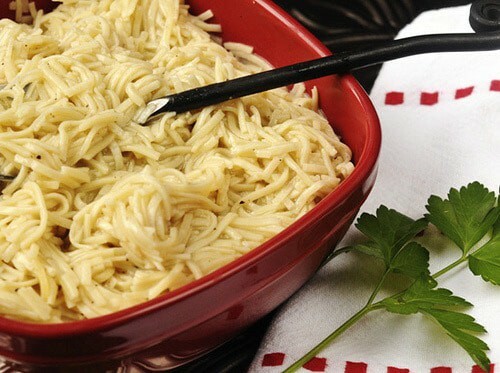 Noodles should NOT stick together as they come out of the cutter. If they do, allow the dough to dry longer or dust with more flour. Fresh-cut noodles may be cooked immediately. Otherwise, allow cut noodles to dry for several hours. Occasionally, walk over to the noodles and give them a quick toss with your fingers to encourage even drying. When brittle, place in zippered plastic bag and store in a cool, dry place for up to a week or freeze. Pour 3 cups rich chicken or turkey stock into a medium saucepan and boil. Reserve 1 cup of stock. Drop noodles into boiling broth and cook until tender–about 1 minute if noodles are fresh and undried. If dried, cook longer–5-6 minutes. Turn off the heat but do not drain. As noodles sit in the hot broth, they will absorb moisture and the entire mixture will thicken slightly. 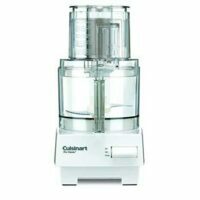 That’s just what you want for serving over or next to mashed potatoes. Add remaining broth, if necessary, to keep your noodles moist. Like all pasta, they will absorb more liquid the longer they marinate in broth. P.S. Did I mention this recipe is not for beginners unless you have a grandma beside you? 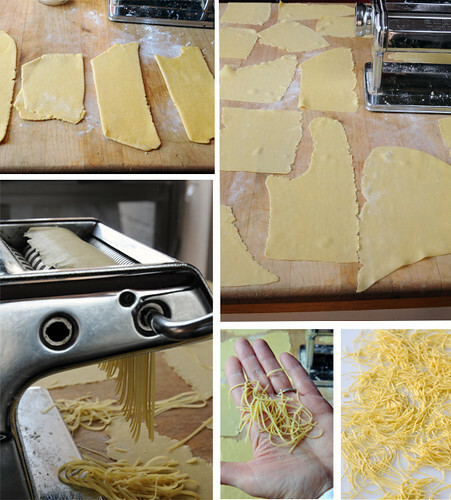 Recipe and instructions for homemade egg noodles using food processor and simple pasta machine. Add flour to food processor bowl along with salt and baking powder. Pulse several times to mix. Add egg yolks and half of the cream to dry ingredients and process until texture of corn meal. Gradually drip in the rest of the cream until the mixture is just damp enough to stick together when pressed with your hand. It should not be wet or excessively sticky. Knowing when you've added the right amount of liquid takes some experience best learned from your own mistakes or while watching over Grandma's shoulder. If necessary, add more flour or cream/milk. Use your fingers to press dough into a ball and remove from the bowl. Cover and allow to rest 10+ minutes. Divide dough into 4 sections. Smash each section into a flat pancake with the palm of your hand on a floured board. It's OK to be liberal with the flour. Set noodle machine thickness to 1 and roll one dough patty between the smooth rollers. Fold over and put through machine again. Repeat process at least 4-5 times until sheet of dough is smooth and shiny. Do this with each patty. Although this sounds time consuming, it goes fast once you get the hang of it. When noodles reach desired thinness, lay them out to rest and dry making sure there is no overlap between strips. When noodles have dried just enough (again, experience is the best teacher), cut strips as long as you want your noodles. I usually make mine 3-4 inches. Feed strips through the fine noodle cutter. Noodles should NOT stick together as they come out of the cutter. If they do, allow dough to dry longer or dust with more flour. You may cook fresh-cut noodles immediately. Otherwise, allow cut noodles to dry for several hours. Occasionally toss cut noodles with fingers to encourage even drying. When brittle, place in zippered plastic bag and store in a cool, dry place for up to a week or freeze. Pour 3 cups rich chicken or turkey stock into a medium saucepan and boil. Reserve 1 cup of stock. Drop noodles into boiling broth and cook until tender--about 1 minute if noodles are fresh and undried. If dried, cook longer--5-6 minutes. Turn off the heat. Do not drain. 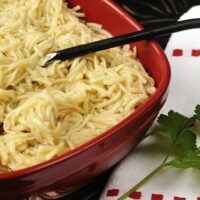 As noodles sit in the hot broth, the noodles will absorb moisture and the entire mixture will thicken slightly--perfect for serving over or next to mashed potatoes. Add remaining broth if necessary to keep noodles moist. Like all pasta, they will absorb more liquid the longer they marinate in broth. I am so excited to see your post about egg noodles for the holidays! Growing up in Indiana I too thought everyone did this for the holidays and was dismayed when I moved around the country and found out only my Indiana family did. Thank you for making me realized it was not just family! Angell, Did you have your noodles for Thanksgiving? We had them at my sister’s house in Alabama. Wonderful! Talk about comfort food. That is the ultimate. Oh, I’m so homesick right now!!! These are like the noodles I grew up eating. Every holiday my Grandmother made a huge pot of these. They were everyone’s favorite item on the table. I am from Indiana as well and now live in Texas. Just like Paula, I thought everybody ate noodles like these. Seems odd that I am making them now without having a my entire family with me to devour them. Thank you Paula. I have been making noodles w/ machine since my mother had to order crank machine from Italy (over 50 years ago). When RA hit I could no longer crank so my son bought me the same type machine w/ a motor. I have used every recipe known and they are all good as long as they contain eggs. What a thoughtful and generous son you have. I’m looking forward to making noodles soon for Thanksgiving and Christmas. Good to hear from you. I just keep staring at these noodles. Aaaaah yes! As a certain smell can bring back so many memories, so the sight of homemade noodles reminds me of past family holidays, traditions, fun, Rook games and board games, lots of noise and laughter with aunts, uncles, and cousins. I even confess to a few tears over the memories of Grandma Herd rolling out noodles and pie dough in her kitchen with that feed-sack apron. Yum! Noodles are one of my favorite holiday foods! Allen also grew up eating noodles, so we’ve made them a couple of times. Maybe we’ll have to make some this weekend. Thanks for the great post! Homemade noodles! I love the thought but have not tasted and cannot imagine making. I have trouble making the bread machine work but you inspired me to try that at least. The Italian in me loves any pasta, of course, but I will have to hope that you will share your homemade noodles with me some day so I can have the tasty experience. Thanks Derinda. I’m sure Ellie will have many, many good memories in Kay’s kitchen, not the least of which is making gingerbread houses. I heard they did a good job this year. I am sure saliva is dripping down my chin right now… I sure hope my mom comes through with the noodles for Christmas dinner! This post seems extra special…I love your sweet memories that originated in the kitchen! I am imagining Ellie having very similar memories with Grandma Kay. Noodles. My favorite comfort food. The recipe for these noodles is very similar to my Grandma’s (who was also from Indiana). She made them the way her mother made them. Each generation seems to add or do something different/additional to the recipe. I added a bit of yellow food coloring to the egg mixture to make the noodles richer. I see that you don’t add meat to the noodles. Still good no doubt. We didn’t eat them with gravy as the thickened broth became a gravy of sorts. Sometimes she would make beef and noodles, but we much preferred the chicken version. We also ate them on top of mashed potatoes. Sometimes that’s all we would eat. A plate full of chicken and noodles over mashed potatoes. Nothing is better!!! Oh yes, forgot about the food coloring. I have done that in the past too. And some of my family prefers beef broth instead of chicken just as you mentioned. And my noodles often have bits of chicken in them, especially if I make them outside of a holiday.